5/21/2007 – A further miscellany of mysteries from Chess Notes includes an alleged tournament game in which Black was mated at move three, the unclear circumstances of a master’s suicide, a chess figure who was apparently unaware of his year of birth, the book allegedly found beside Alekhine’s body in 1946, and the chess notes of the poet Rupert Brooke. Join in the hunt for clues. C.N. 4506 noted that on page 64 of his book TV Chess G. Koltanowski affirmed that the game went 1 e4 f6 2 d4 g5 3 Qh5 mate and occurred between players named Mayfield and Trent at the US Open at St Louis. So what is the truth about this game supposedly won by Masefield/Mansfield/Mayfield and lost by Trinka/Trinks/Trent? 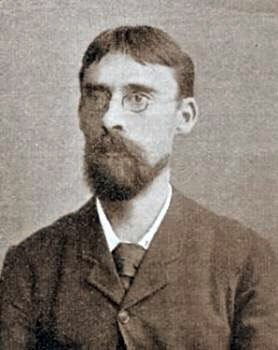 Deutsches Wochenschach (15 August 1909, pages 285-286) put no exact date, merely stating that Swiderski had died suddenly in the past week. 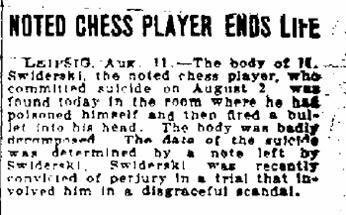 Deutsche Schachblätter (15 August 1909, page 56) accorded Swiderski’s death five lines, reporting that he had died suddenly in his 31st year. Nor was a date specified by L. Bachmann is his obituary of Swiderski on page 194 of Schachjahrbuch für 1909 (Ansbach, 1909). The Wiener Schachzeitung (October 1909, pages 351-352) printed an impossible date of death (2 September), whereas the American Chess Bulletin (October 1909, page 227) put 2 August. What further information is available in the German press of the time or in official records? 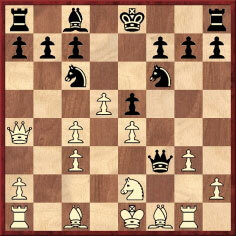 Black is said to have won by 1…Nxe4 2 dxc6 Qf2+ 3 Kd1 Qxe2+ 4 Bxe2 Nxc3+, but who was he? The position appeared with the meagre caption ‘N.N.-Burn’ on page 322 of Moderne Schachtaktik, volume 1 by L. Pachman (Berlin, 1961) and on page 195 of the Czech version Taktika Moderního Šachu (Prague, 1962), although it was omitted from the heavily-abridged English translation, Modern Chess Tactics (London, 1970). We asked in C.N. 2837 whether Black was really Amos Burn (or, perhaps, one of the Byrne brothers). From library catalogues we note that the book first appeared in Hungarian in 1958. Can any reader send us a copy of the relevant passage? 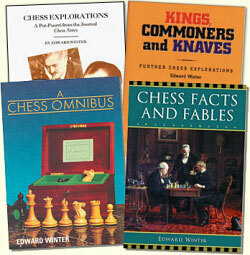 See also page 904 of the outstanding book Amos Burn A Chess Biography by Richard Forster (Jefferson, 2004). That might be regarded as putting an end to the matter but, as mentioned in C.N. 1623, page 146 of the 1 July 1949 issue of Purdy’s own magazine, Chess World, stated that he was born, in Port Said, in 1907. The year 1907 was also given in an article about Purdy by Gunars Berzzarins on page 282 of the December 1951 Chess World, and C.N. 4924 mentioned too the second edition of Purdy’s book Guide to Good Chess (Sydney, 1951); once again, the year stipulated (in a ‘thumbnail biography’ from Who’s Who in Australia) was 1907. Page 161 of the August 1960 Chess World had a biographical feature on Purdy, and it too put 1907. Jeremy Gaige was still giving 1907 in the revised edition of A Catalog of Chessplayers & Problemists (Philadelphia, 1971). 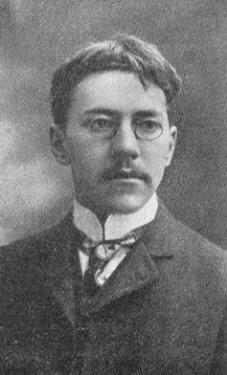 However, 1906 was the year presented by Anne Purdy (whom he married in 1934) on page 14 of C.J.S. Purdy His Life, His Games, and His Writings edited by J. Hammond and R. Jamieson (Melbourne, 1982). Assuming that Purdy was not born in 1907, when exactly did he find out? Above is a photograph of C.J.S. 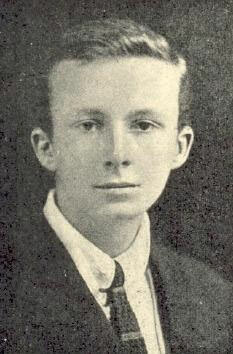 Purdy in the 1920s (from page 284 of Chess World, December 1951). There are many mysteries concerning the death of Alexander Alekhine in Estoril, Portugal, and no-one has established with certainty the cause of his demise (see our feature article 'Alekhine's Death'). One curious sideline was discussed in C.N. 3087. 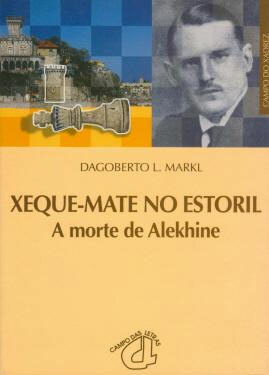 According to reports related on pages 70 and 84 of the book Xeque-Mate no Estoril by Dagoberto L. Markl (Porto, 2001) and emanating from the Portuguese newspaper O Século of 25 March 1946, a poetry book, Vers l’Exile, was found beside Alekhine’s body, open at a passage which read (in our translation from the two slightly different Portuguese versions given), ‘This is the destiny of (all) those who live in exile’. Xeque-Mate no Estoril had two spellings of the poet’s name, ‘Margareth Sotbern’ and ‘Margaret Sothburn’, and we have been unable to identify the poem or the poet. Can any reader do so? As mentioned in C.N. 2372 (see pages 162-163 of A Chess Omnibus), various quotation books attribute the observation ‘History repeats itself; historians repeat one another’ to Philip Guedalla, in his 1920 work Supers and Supermen. In that item, though, we pointed out that the English poet Rupert Brooke (1887-1915) gave the epigram as his own invention in a letter to Geoffrey Keynes dated 4 June 1906. 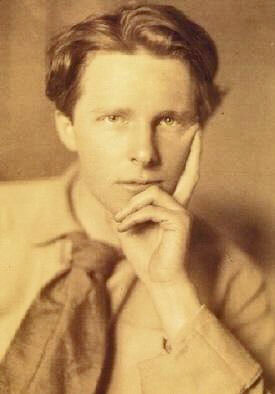 See pages 53-54 of The Letters of Rupert Brooke chosen and edited by Geoffrey Keynes (London, 1968). It would seem that Brooke was copying openings material from a book or magazine, but which one? The reference to Staunton relates to remarks which had originally appeared on page 148 of his Handbook (London, 1847). 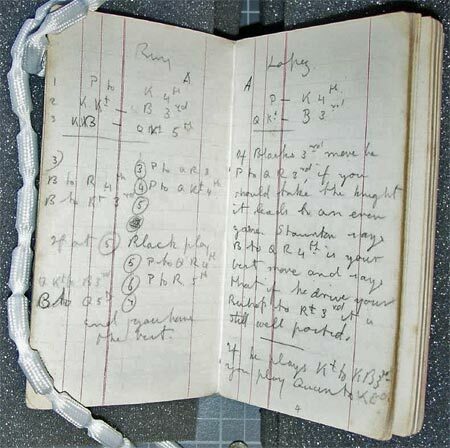 The other pages in the notebook have only brief jottings about chess openings. 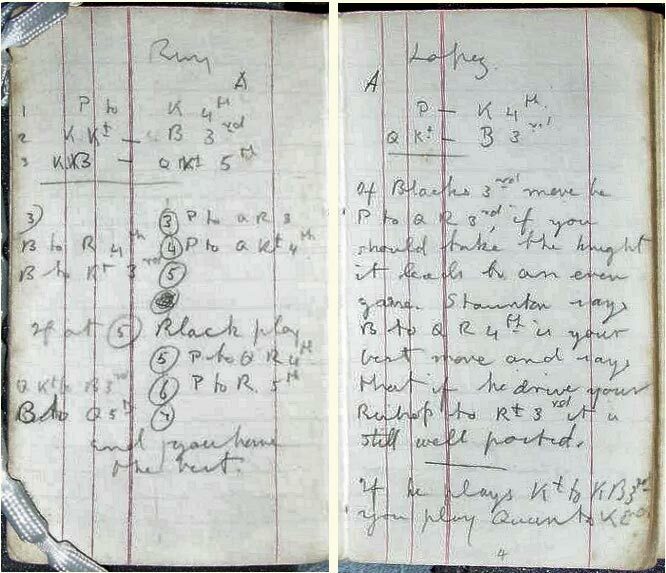 Elsewhere there are two (non-chess) entries dated 1902 and 1904, suggesting that the chess material was also written around that time, when Brooke was at Rugby School.